If you have an embedded chart then you can easily select the chart. 1) By seleting the Chart Area. 2) By selecting the Chart Object. To select the chart as an object, hold down the Ctrl key while selecting the chart with the left mouse button. 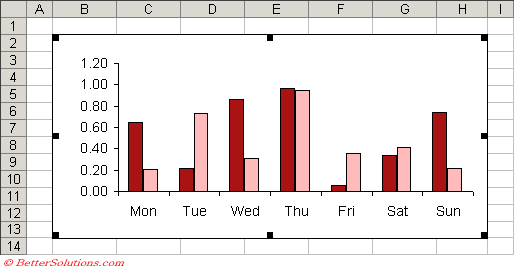 A selected chart displays a black border. To select a chart move the mouse anywhere over the chart and press the left mouse button. You can deselect a chart by selecting any cell, with the left or right mouse button. You can use the arrow button on the Drawing toolbar to select a chart and then type the name in the Name Box. You obviously cannot move a chart item to a location outside of the chart area. A chart is just an object that is placed in the drawing layer of the worksheet.